And so it comes to an end, this sojourn in Paris. One month in Paris and now, suddenly it seems, we must leave. We don't really want to leave, yet it will feel good to be home again. Spending one month in one place meant we were able to get to know our neighbourhood. Out of those 30 days, we had our morning coffee at Le Brio, down the street from our apartment, on at least 28 of those mornings. Sometimes we had lunch there, or an evening meal, and often, after walking home from a night out, we stopped there for a cognac before turning in. We got to know, a wee bit, a number of people at Le Brio, including Fabien, Lilou, Lily, Anne and a wonderfully caring young bartender-server who just celebrated his 17th birthday (one of the best bottles of red we had in Paris was on his recommendation!). On our last day in Paris we stopped in for coffee in the morning, as usual, and were treated royally by Fabien and Lily, with warmth and best wishes for our return home. At night, after a long day, we dropped in again for one final digestif before bed. Again, when our hosts heard we were leaving the next morning, there were hugs and kisses, handshakes and high-fives all round, and additional, and generous, digestifs before leaving. It was an emotional end to a wonderful final day in Paris, and to our sojourn in Paris. Travelling isn't just about seeing the sights, buildings and monuments. It's also about making connections with people, trying to converse in a different language and sharing those moments with smiles, laughter and understanding. Le Brio was that kind of place for us. Merci. Salut! À bientôt, j'espère. During our sojourn in Paris, we saw people, mainly at the Louvre, having their pictures taken, while they performed a strange sort of salute, usually with their right arm. Well, that's what it looked like to Jeem. Often the arm would be outstretched or partially bent, and the fingers on the hand would be coming together as if holding a string. Sometimes the hand would be flat as if patting, or even worse, giving a salute that hasn't been appropriate for over 60 years. "What is going on?" we wondered. Well, maybe Jeem wondered more than the others in his party. Could this be a variation on the terrible quenelle salute that created much controversy over the past two years? 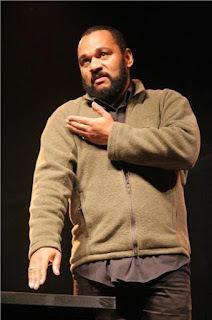 The quenelle gesture involves touching or gripping your shoulder with one hand while holding the palm of your other hand outstretched and pointing to the ground. The BBC reported it is a combination of the bras d'honneur, which means up yours, and a reverse form of the Nazi salute. French politicians and Jewish leaders, both secular and religious, called it anti-Semitic. The gesture was first made by the popular French comedian known as Diudeonne. He is a strange character in the story, once being part of an national anti-racism campaign, he is now firmly aligned with the far right. Almost to the point of being one of those crazy people who blame Jews for everything, including the attacks on 9/11. That's him on the right. While he says the gesture he first made is an anti-establishment symbol, his comedy routine features jokes about the Holocaust and Jews in general. The gesture went viral after several French football stars performed it after scoring goals in France and the UK. 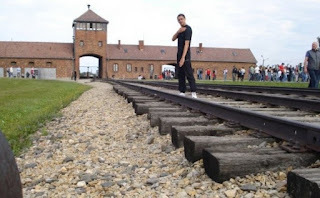 Well, if it isn’t anti-Jewish, why are its adherents performing it outside Jewish shops and museums, in front of synagogues, Jewish cemeteries and Holocaust memorials, outside Jewish schools, in front of posters of Anne Frank and, should there still be any doubt, on the railway track leading to Auschwitz? The pictures, thousands, appear on social media sites on the Internet. Thankfully, what is going on here, at the Louvre, is not the quenelle. Not even close. It took Jeem a bit of time to figure it out, but these nice tourist-types are positioning their fingers so when the photos is taken it looks as though they are touching, or lifting, or holding in some way, the Eiffel Tower, or one of the pyramids at the Louvre, or some other iconic symbol of Paris. Kind of a cute I suppose. 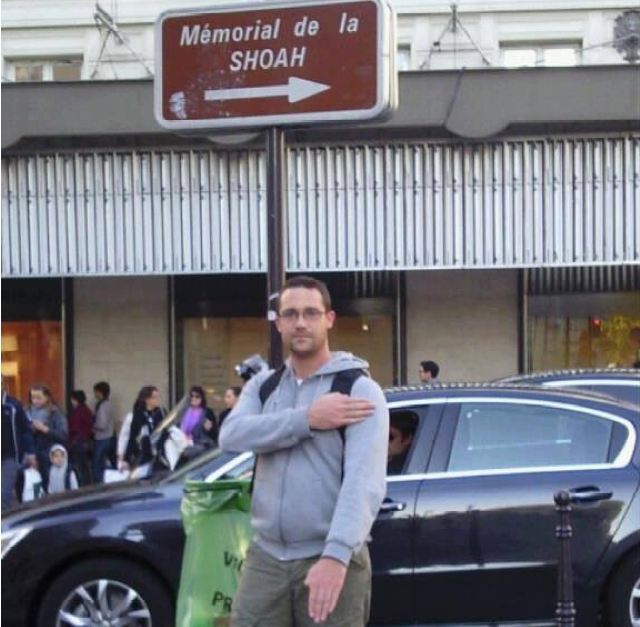 In our time wandering around Paris, we never saw anyone performing the quenelle salute. Perhaps the quenelle has died out, though I'm guessing not. There is a large segment of French society that feels shut out of full citizenship, be it in education, employment or political life. Frustration, despair and inequality feed extremism, and we ignore those root causes at our own peril. Except for those featuring the quenelle - lifted from various places on the Internet, without permission, from people who obviously aren't ashamed of what they are doing. You can't help but notice, smoking is a big thing in Paris. 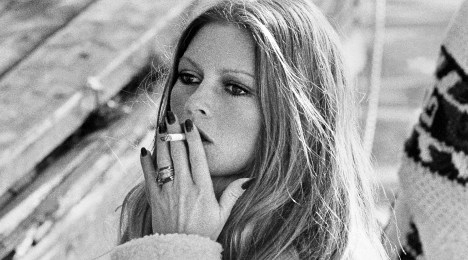 At times it seems everyone around you is smoking; young, old, women, men, it doesn't seem to matter. During the past month in Paris I feel I've had at least a pack a day simply through second-hand smoke. I've never been a smoker, so this is a new experience for me. France has a reputation for being the cigarette-chimney of Europe. A casual check of tourist websites and you will find that smoking always figures highly in those unexpected-things-I-learned-about-Paris or the-ten-things-I-dislike-about-Paris polls. Smoking is always either number one or two. For one thing, while there is a ban on smoking indoors, including all restaurants and public buildings, there isn't a ban on smoking on patios and the sidewalks. So, bistros and cafes expanded their seating outside, and the disgusting smokers migrated there out of necessity. On most nice spring days in Paris, everyone wants to sit outside, including non-smokers and tourists, and that's where we get the impression that this city is a chimney. In reality, smoking has declined in France by 60% over the past 50 years. In line with most EU states, France is much less likely to light up than it once was, and rates slightly under the the official European average of 28% of the population smoking. Indeed, the anti-smoking group Droits des Non Fumeurs claims that only 47 billion cigarettes were consumed last year, compared to 84 billion in 2001. Young smokers buck the trend slightly, and alarmingly, France has a much higher rate of youth and young adult smokers than most of its European neighbours: 29% of students smoke in France compared to only 20% in the UK. Women here also smoke at a higher rate than in Canada or the rest of Europe. Overall, France is not especially a nation of smokers and it isn't all that far removed from Canada in that regard. Sitting outside at a bistro however, the impression is quite the opposite. Sidewalks and gutters are littered with butts. If you absolutely can't deal with second-hand smoke, you will have to sit inside until the laws about smoking outdoors are reviewed. And they will be. Someday. As for my new craving, I'm sure it will disappear once I return to the clean air of Vancouver. In the meantime though... where can I find a Parisian patio filled with smokers? Photos by Jim Murray. Copyright 2015. Black and white photo from AFP. Le Marais is one of the trendiest areas in Paris and it holds a number of buildings of historic and architectural importance, plus lots of galleries and shops. La Perla. We stayed a few doors down from La Perla on our last visit and discovered their Happy Hour to be one of the best values in the city. Your walk in the Marais could start with La Perla, or it could start elsewhere too as it spreads through much of the 3e and 4e arrondissements, from the Seine to Place de la République, and from Place de la Bastille to the Centre Georges Pompidou. It is a wonderfully diverse community. It's also an area filled with old buildings, narrow streets and alley ways that remind us of a time long ago. The building below was originally built in 1508 and restored in the 1960s. Previously an area for the wealthy class in Paris, the nobility left for better digs at the end of the 19th century. From then and through the first third of the 20th century the Marais became a vibrant collection of Jewish neighbourhoods as East European Jews flocked to Paris. That changed of course with the occupation of Paris by the Nazis and with the complicity of the French government and people of the time. 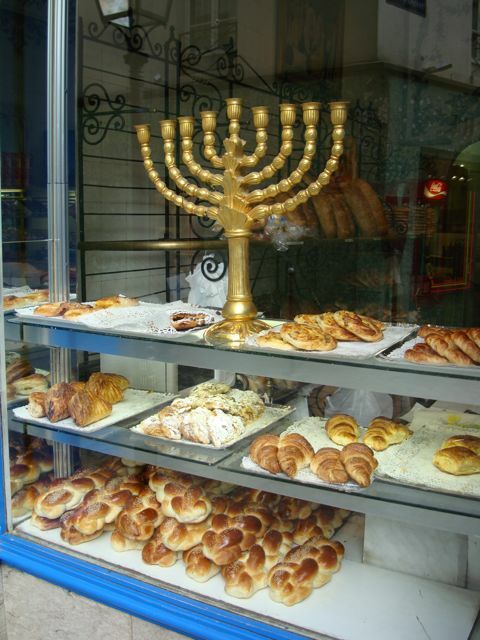 Since the 1990s there has been a resurgence of Jewish life in the Marais. 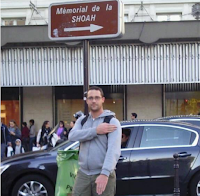 That growth has faltered with recent attacks on Jews in Paris and throughout France. An alarming statistic that came up in an article by Jeffrey Goldberg for the April issue of The Atlantic, refers to France's 475,000 Jews, amounting to less than one percent of the nation's population, yet, according to the Interior Ministry, 51 percent of all racist attacks targeted Jews. The Jewish neighbourhood in the Marais revolves around rue des Rosiers, and it is a wonderful area in which to wander. Bagels can be found, bookstores, Kosher food stores and restaurants, and assorted other shops and services with obvious connections to the faithful. 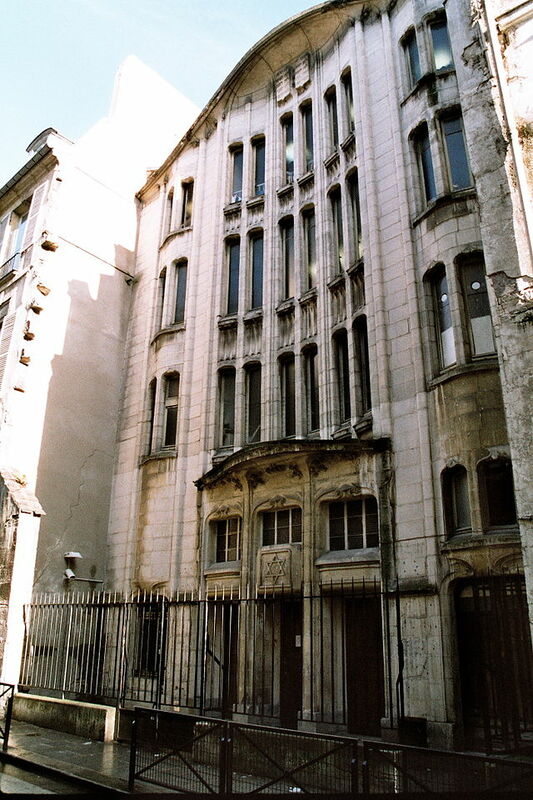 A synagogue built over 100 years ago is near rue des Rosiers, and the Mémorial de la Shoah , its library and bookstore are nearby as well. The area is heavily policed, and the sight of camouflaged military men and women strolling the streets while carrying machine guns, and appearing to be ready to use them at any moment, can startle if you aren't prepared (and we were never prepared). In recent years the Marais has become popular with artists, designers and shopkeepers. Upscale fashion houses have set up shop along side local artisans. Tourists come to the Marais in large numbers for the shopping, the galleries and the scene, but people live here too. Since the 1990s the Marais has become a centre for the LGBT community, as both a place to live and to do business, as evidenced by many gay cafés, nightclubs, cabarets and shops. It's a wonderful mix of old and new, faith and pride, art and rampant commerce that makes the Marais a great place to visit. And you can always end your walk back at La Perla for the best margaritas in Europe. It's difficult to dine in Montmartre. Within the shadow of the Islamic-inspired dome of Sacré-Cœur, most restaurants are committed to full-on fish and chips and burgers, or providing some weirdness of what they perceive the normal tourist expects in French dining: onion soup, escargot, etc. Which is true of course, but it doesn't seem to exist anymore except in a twisted tourist version. It, the French version of what they think we want, fails horribly sometimes and expensively, and in Montmartre's tourist districts that can be disappointing indeed. 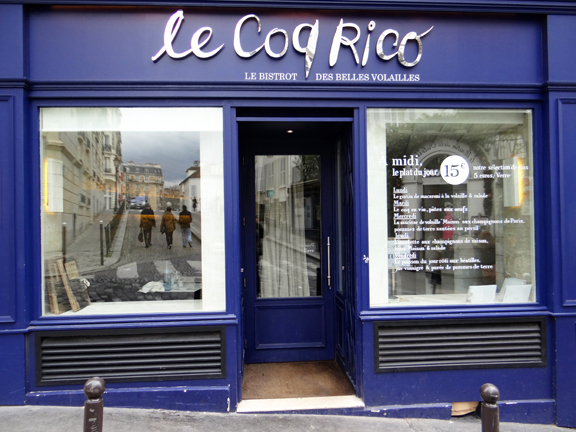 New things are happening in French restaurants of course, and three examples are found along the long and winding rue Lepic in Montmartre. One is exceptionally busy with locals and tourists alike, though I can't imagine why. 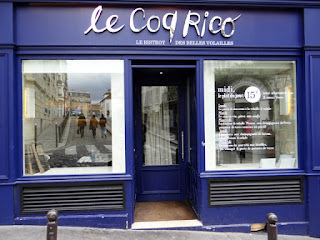 It's called Le Coq Rico and it serves chicken. And that's about it. Oh, there are a few other dishes thrown in to confuse matters, like guinea fowl and pigeon, but it's basically chicken and mainly roasted chicken at that. Good, maybe even really good, but we grew up with roast chicken on Sundays made by Mom, and we don't need to pay an arm and a leg for it here in Paris. Do we? Well apparently we did and that's why I'm warning you. Another new-style resto-bistro-bar, or whatever they might want to call it, is La Dégustation, and it shows great promise. A variety of open wines and champagnes are offered by the glass, offering an easy way to try different wines with different dishes. 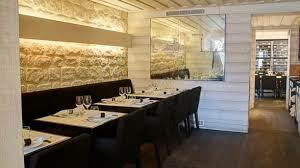 The food dishes are prepared simply in an open kitchen in view of diners with fresh ingredients and all that stuff. Again, a great concept: French cuisine re-invented for a new generation. However, when we dined one night, service was distant and confused. For a place that promotes a great selection of wines, our two servers were unsure of what to suggest with the different dishes and more concerned with pouring only the absolute maximum of 20 cL into each glass. The potential for fun and interaction between server and customer was lost entirely. The food was nicely prepared and presented, but not particularly exciting. Bland comes to mind, and La Dégustation wasn't fun, though it's modern-bistro layout would suggest some sort of revelry. Our third candidate along rue Lepic is a place called Jeanne B. 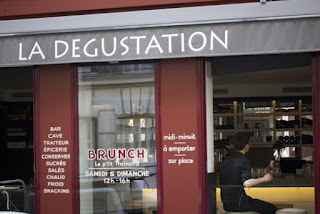 Similar to La Dégustation with a nice selection of wines, an open kitchen concept, fresh and in-season ingredients and a menu that changes from day-to-day depending on what is available. Jeanne B succeeds. 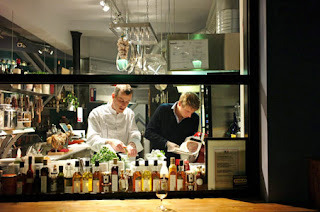 In fact, it succeeds impressively with friendly and competent servers and an impressive kitchen crew. Our waiter, we visited twice and he served us both times, always had great recommendations for wine, and after allowing us to taste the wine before pouring, he sloshed it into the glass, offering a smile and his reasons for loving that particular grape. Customer service isn't all that difficult when people enjoy what they are doing and have some fun doing it. The food at Jeanne B is wonderful. Some might consider it expensive for the portion size, but when considering the ingredients and the wonderful range of flavours hitting your mouth, it's a bargain! There is almost always a veloute de jour, a cold puree that's light and creamy, and highly recommended. The menu is brief and always includes a vegetarian option as well as some twists on meat, seafood and poultry. No onion soup here. Jeanne B has its act together; it doesn't pretend to be something it isn't, and it appreciates its customers. There are some tables outside and it's great to sit along the cobblestone street and watch the people go by. Jeanne B is not fine dining with white table cloths. 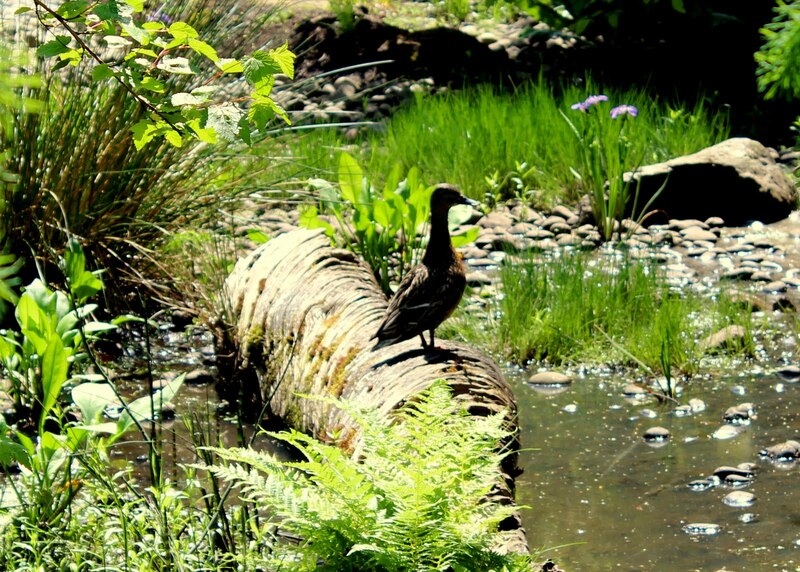 It is adorable, charming and unpretentious. After wandering around Sacré-Cœur, it's an oasis of simple pleasure for une parisienne like Sherry. Photos of Jeanne B by Jim Murray, others courtesy the restaurants' websites. Copyright 2015. You can follow my photos and points of view on coffee, culture and politics on The Murray Chronicles. Simply click on the image. Salut! The Murray Chronicles ~ Culture. Coffee. Politics. Because everything is. Getting around Paris: Metro or Bus? I'm a traveler and photographer from Vancouver, Canada. I'm also active in provincial politics as president of the Vancouver-Langara constituency for the BC New Democratic Party. I work for Kwantlen Polytechnic University as the Text Buyer in the bookstore operations. I also serve on the Senate of KPU as elected representative from the professional support staff and my union, the BCGEU. Copyright 2015 by Jim Murray. Travel theme. Powered by Blogger.